HTML code consists mainly of what is known as tags. 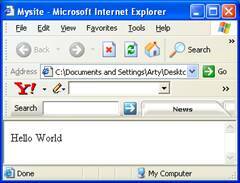 An example of a tag is <html></html>, which indicates to the browser the start and end of the web page. Another example is <title>Mysite</title>, which tells the browser to display Mysite as the title of the page.